Pioneers in the industry, we offer price computing scales, electronic price computing scales, npc-n series price computing scales, npc series price computing scales, digital price computing scales and nep pc series price computing scales from India. We bring forth an extensive range of highly advanced Price Computing Scales for our patrons. Finding a vast application in departmental stores, these are highly demanded in the market. Owing to its compact design, feather touch keyboard and longer service life, the entire range of price computing sales offered by us has been a preferred choice of our revered clients. Our organization is engaged in offering a wide range of premium quality Electronic Price Computing Scales to our esteemed customers. 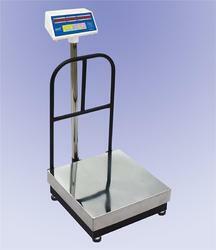 These scales are sourced from highly certified and trusted vendors to ensure optimum standards of quality. 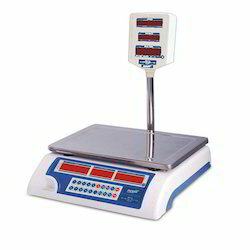 The offered scales are used in grocery shops and departmental stores to accurately measure the weight of different items with manual price computing function. 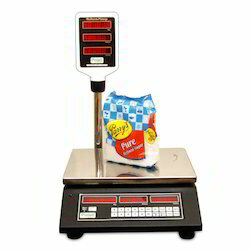 16 digit red bright LED display in table top & 18 digit display in platform Scale. Display showing Item No., Unit price, Weight, Total price & Item Name. Data of 500 commodities can be entered using keyboard or can be downloaded from computer. Prepacked items can be added in the bill. Name and address of the shop owner can be entered using Alphanumeric keyboard or can be downloaded from computer and the same can be printed on bill. Can select three different modes for printing: (1) Print the bill directly from weighing scale. (2) Print Barcode of individual Item (Barcode will consist of Item No. & Weight). (3) Transfers the weight data constantly to the computer. Type of printer can be selected for Bill Printing Mode. Accumulated commodity wise record can be printed. Indication for A.C. On, Nett/Gross weight, Battery, Battery low. HOLD function for locking the display of weight. Compatible with HDPOS Smart Software. Model with lower/better resolution are also available. 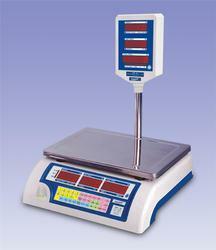 Multi-interval instruments(Dual Accuracy Scales) are also available. 7.4V,1.5 AH Li-Ion battery with charger. 16 Digit Red bright LED display. Indications for A.C. On,Nett/Gross weight, zero, battery, battery low. HOLD' function for locking the display of weight. Memory facility to store up to 100 items. Individual billing & accumulated commodity wise record can be printed. Model with lower/better resolutions are also available. Backed by a dexterous team, we are capable of trading and distributing a comprehensive range of supreme quality Price Computing Scales. These offered products are widely known for their feather touch membrane keyboard. Driven by a client-centric approach, we further ensure the cost-effectiveness of the entire range of price computing scales offered by us. Indications for A.C. On, Nett/Gross weight, Zero, Battery, Battery low. 18 digit red bright LED display in table top. Display showing Item No., Unit price, Weight, Total price & Item Name. 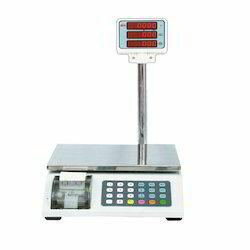 Can select three different modes for printing: (1) Print the bill directly from weighing scale. (2) Print Barcode of individual Item (Barcode will consist of Item No. & Weight). (3) Transfers the weight data constantly to the computer.